Home > Timesheets > Timesheets - FAQs > Can I Enter Time for the Entire Week? Click on Time & Expense tab > Timesheets. On the top-right, you will see two options, Day and Week. Click on Week to switch to the Week View. You can add a new entry by clicking on Add Row, and then select the Project, Category, and Task (optional) you wish to record time for. You can easily enter time for the entire week using Week-view. 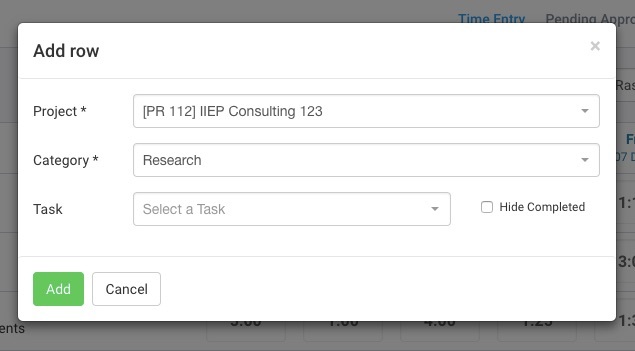 For any project where the Task field was made mandatory, you will not be able to save the time entries without selecting a task. You can also submit your timesheet entries for approval in bulk using Week-view. Once submitted, you can still enter hours for other days in the same week and submit them for approval. To read more about Timesheets, please read Getting Started with Timesheets.